What is breaking our story wide open is the action of the ACLU to sue the Cook County State’s Attorney, Anita Alvarez, in Federal Court to stop her office from prosecuting citizens who audio-record police in public. This is a calculated effort to create Federal case law on the topic of audio-recording police in public. Now that is substantial news! I am the single live case cited in their lawsuit. This make me the poster-boy for the issue of audio-recording police in Illinois and, eventually, alongside Anthony Graber (see below), nationally. Then the Tribune followed up with an editorial by their editorial board last week largely in support of our view of the issue. WBEZ – National Public Radio is running an interview with me and others on this issue tomorrow morning, Wednesday, 9/1/10. Check it out. The story of Anthony Graber is plowing the way for our case in the national news cycle. His case is significant because it is the case of a good-old-boy speeding on his motorcycle with a videocam on his helmet getting jacked around by a jack-booted cowboy cop in plainclothes with his gun out looking like a road-rage maniac. Then, when Anthony posted his video to Youtube the Maryland cowboy with his cop buddies freaked and raided Anthony’s mother’s home without a proper warrant. The photo-grab from the video of the cop with his gun out is compelling and the news people love riveting visuals. My case came before his. It is more illustrative of the real dangers of the State using its powers to selectively prosecute citizens based on their political views and as a tool to silence social critics. Even though our case is less sensational, we are able to use the attention Mr. Graber gets to tell our story. Our case is more likely to create the case law that makes real change. Please stay tuned. All this means our annual T-shirt Art Harvest Festival the last weekend in September is going to rock. Party for freedom at the T-shirt Art Harvest Festival, September 24-26th with art and music all weekend long at the American Indian Center, 1630 W. Wilson Avenue. Also displayed will be comments by people from around Chicago and the Nation in reaction to the actions of the States of Illinois, Maryland and Massachusetts to incarcerate citizens for exercising their First Amendment right to audio-record their public servants (police) in public. Thirty-eight States recognize this right but nine are wavering and three are very bad actors attempting to take your rights away. Tell them what you think! All who attend will be invited to add their own comments on this pressing issue confronting our Nation today. Your comments will be posted online to illustrate the decision of the Court of Public Opinion. Your voices are powerful. Please donate to help us support socially conscious art actions. To read more about this event visit this link. To see the bands that are playing visit this link. Want to help? You can download our fool proof flier and print it out on both sides. Cut them to make four fliers per sheet. Then you can pass them out to all your friends. Or come to our Sunday and Wednesday workshops to pick up already printed fliers to distribute. Mexican Labor News and Analysis (MLNA) is produced in collaboration with the Authentic Labor Front (Frente Auténtico del Trabajo FAT) of Mexico and the United Electrical Workers (UE) of the United States, and with the support of the Resource Center of the Americas in Minneapolis, Minnesota. MLNA can be viewed at the UE’s international web site. For information about direct subscriptions, submission of articles, and all queries contact editor Dan La Botz at the following e-mail address: labotzdh@muohio.edu or call in the U.S.(513) 861-8722. The U.S. mailing address is: Dan La Botz, Mexican Labor News and Analysis, 3503 Middleton Ave., Cincinnati, OH 45220. The UE Home Page which displays Mexican Labor News and Analysis has a complete Index of back issues. Staff: Editor, Dan La Botz. Frequent Contributors: David Bacon, Fred Rosen. Hmmm. Please note that the same hospital has just announced they are going to lay off 140 workers. KABUL, Afghanistan — Ever since the Afghanistan war became a counterinsurgency fight, critics have charged that commanders’ cautions about using force only inhibit the fight against the Taliban. But in the shadows, NATO Special Operations Forces are engaged in an intensely lethal war of their own. Automation Alley, the state’s largest technology consortium, is stepping up efforts to nab more work in homeland and border security for Michigan companies. Iranian President Mahmoud Ahmadinejad skipped onto a stage yesterday, drew back a blue curtain, unveiled a shiny gold drone, and pronounced it an ambassador of death” to Tehran’s foes. So does that mean Tel Aviv should be worried about Iranian robo-bombings? At the moment, probably not. . . .
A software error, combined with an unfortunate user action, led to a US military robot helicopter – developed from a manned version and capable of carrying a fearsome arsenal of weapons – straying into restricted airspace near Washington DC, according to reports. Denver, Colorado (CNN) — It was a glimpse into the future, when convoys rumble toward the battlefield without a driver behind the wheel, aircraft soar without pilots on board and robots glide forward to fight with machine guns and grenade launchers, all the while beaming back video. Hundreds of displays at the Colorado Convention Center this week in Denver allowed the Association of Unmanned Vehicle Systems International (AUVSI) to show off its sharpest designs and latest inventions. Some of these machines already are on duty in Iraq and Afghanistan. . . The market is in recovery. Finally, those who, over the last few years, have been forced to diversify to remain competitive – downsizing teams and stretching budgets in the process – can breathe a sigh of relief. “It has been a difficult period, but many [companies] have performed well [during the downturn]. They’ve remained competitive and [in some cases] even expanded. With the market beginning to recover, the race is on to find ways to improve efficiency, increase productivity . . .
One of the key benefits of automation is its ability to reduce labor costs, which in many instances represents the largest overhead in any given warehouse or distribution centre . . .
Can this ‘robot’ help save publishing? University of Texas Co-op--the most profitable independent college bookstore in the United States--has purchased an Espresso Book Machine and is aiming is to "revolutionize how the store does business and interacts with the local community." 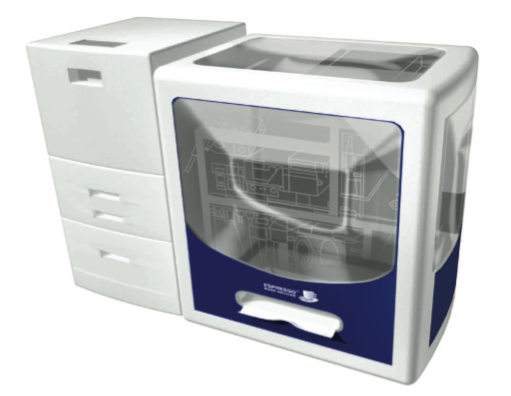 The espresso will print and bind a 300 page paperback in 4 minutes. The $150,000 Espresso Book Machine can print a professional-looking paperback in about four minutes. 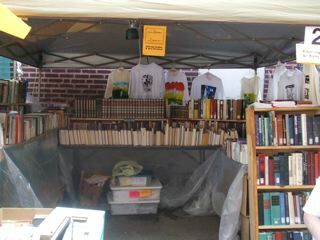 More small presses are looking at it as an option to cut down on printing costs and better manage inventory. China’s large coastal manufacturing hubs have, for many years, been the production base of choice for domestic and multinational companies looking to take advantage of the country’s vast pool of inexpensive labour. But along with a strengthening renminbi and government action to curb pollution and overcapacity, an upsurge of labour disputes since May suggests that the low-cost model of production is no longer robust. Companies that traditionally relied on China as a source of cheap labour are increasingly relocating low-margin production lines to lower cost labour venues – particularly in central China, by speeding up factory automation plans . . . Robot suit for old Japanese grower nearing completion. Thanks to the robot, physically hard work like picking apples becomes easier. The farmer doesn’t have to hold his arm up himself but is helped by the suit. The food and drink sector has been buying in a great deal of packing, palletizing and handling equipment , according to a quarterly survey of members of the British Automation and Robotics Association. The Robotics Association found that the food and drink sector accounted for 17 percent of all robotics sales, making it second only to the pharmaceuticals industry. . .
PLEASANTON, Calif. — Adept Technology, Inc. (Nasdaq:ADEP), a leading provider of intelligent vision-guided robotics and global robotics services, today announced that Austong Intelligent Robot Technology of China placed an order for twelve Adept Quattro s650H robots to automate a secondary packaging operation for a leading dairy processor in China. . .
McKesson US Pharmaceutical will open a distribution center in Caroline County, VA. A local press report says plans call for a 340,000-square-foot center requiring a $50 million investment. The facility will include “solutions for the automated picking of fast- and slow-moving product, . . .
Tokyo entertainment firm Kokoro shows off its latest fembot, Actroid F, in a PR video. The lifelike android is slated to go on sale to work as a receptionist or hospital worker. Robotic vehicles have been used for space exploration, deep-water drilling, high-tech warfare and a range of other exotic applications. But one start-up is gaining traction by creating robots to mow lawns, shovel snow and repave parking lots. . . .
Who Wouldn’t Buy Ice Cream From A Cute Japanese Robot? As if ice cream doesn’t practically sell itself in the summers anyway, a Japanese theme park decided to hire a cute robot named Yaskawa-kun to hawk the delicious treat. I think you’ll understand their choice after you see a video of him at work. August 20, 2010 — This summer, J. Paul Leonard Library faculty and staff gave members of the campus community a preview of the computerized crane system that will retrieve most books stored in the expanded and renovated Library when it is expected to reopen in early 2012. The library retrieval system, or LRS, fills three floors of the Library’s new west addition. . . [An} online request cues the crane to retrieve the bin holding that book, and immediately delivers the bin to a crew of trained student assistants and Library staff. The book is removed by hand, and delivered to the Library’s distribution desk for the patron — all in about five to 10 minutes. But Britons are embracing automation faster than any other country in Europe. Two-fifths of Britons refuse to queue for longer than two-and-a-half minutes, … Some 15,000 automated tills will be in operation by the end of 2011 . . .
UC Irvine Healthcare to perform robotic thyroidectomies. UC Irvine’s innovative Robotic Oncology Center offers minimally invasive treatment in multiple disciplines. In the ever-evolving battle against cancer, the surgical robot is gaining ground. . .
It’s not often here at Crave that we get to write about frog eggs and robot noses in the same story, so when we saw this report in the latest issue of Proceedings of the National Academy of Sciences, we smelled an opportunity. . .
Scientists used robot submarine to wander across the deep of the gulf water and discovered plume of oil under the deep of the Mexican Gulf. In spite of new and unexpected findings by a Berkeley Lab research team that microbes have done an amazing job taking care of the underwater oil plume in the Gulf of Mexico, oil on the surface can cause a lot of damage to wildlife and property if it washes ashore. Researchers at MIT are working out ways to skim that surface oil using a swarm of robots. The robots communicate with each other using a WiFi network, and using GPS then coordinate their movements with software inspired by natural swarms. Oil is dealt with on the spot by heating it thus avoiding a lengthy trip to shore. See the video. Feeling expendable? It’s little wonder when you read stories like this. At El Camino Hospital in Silicon Valley, hospital officials are leasing 19 robots to do work that humans used to do. The robots deliver medication, food and take out trash. Hiring humans to make deliveries would have cost the hospital more than $1 million a year, said Ken King, vice president of facilities. Leasing the robots costs $350,000 a year, which helps the hospital cut costs. The robot’s maker says his robots perform work that people find distasteful or hazardous, such as picking up infectious waste. Add, there’s another benefit, he says: “They don’t take breaks and vacation and you don’t have to pay them benefits.” Hmmm. Please note that the same hospital has just announced they are going to lay off 140 workers. AL AIN, UAE — The Department of Transport (DoT), Al Ain, is in the process of restructuring as part of its move towards automation. The aim is to provide better services. As a result, DoT has had to lay-off some employees who will be provided three months’ salary and other benefits as per labour laws, officials from DoT assured. . . .
Companies are boosting their spending: Could jobs be next? Caterpillar had nearly $4 billion in cash and short-term investments last month. “Shareholders typically don’t like companies that sit on a lot of cash, so we’ll put that to work,” Caterpillar CEO Doug Oberhelman recently told Bloomberg TV. The company last week said it will break ground in September on a new factory in Victoria, Texas, that will make excavators and employ 500 when it opens in 2012. Caterpillar is also increasing capacity to make mining trucks in Decatur, Ill., and enlarging a factory in Aurora, Ill., to manufacture mining shovels, a new product. The initiatives are aimed at meeting rising long-term demand for electricity and construction in both Asia and North America, executives say. The company, which laid off 9,000 U.S. workers last year, is adding about 4,200 in 2010 to operate added plant capacity and meet new demand, . . .
Velodyne Lidar, Inc., a manufacturer of high definition LiDAR (Light Detection and Ranging) sensors, announced the introduction of the HDL-32E to meet the demand for a smaller, lighter, and less expensive product for autonomous vehicle and mobile mapping applications. Exploration of the Red Planet will shift into a higher gear in 2012 with the arrival of a car-sized, instrument-laden robotic rover named Curiosity. If watching movies such as The Matrix or Terminator has taught anything, it’s probably that robots might not be too interested in protecting the environment (and humankind), but the Tree Planting Robot concept design is quite the opposite, as it’s designed to help with reforestation projects. This robot is capable of carrying 320 seedlings at one go, . . . The fly, in other words, believed to be airborne when in reality it was fixed to a tether ("A" in the image above), watching LEDs blink ("B") while remote controlling a robot ("C") from a virtual-reality simulation arena ("D"). Is this The Matrix, or Avatar, for flies? Graetzel tells me the goal of the project was to study low-level flight control in insects, which could help design better, bio-inspired robots. "Our goal was not to replace human drivers with flies," he quips. Swiss researchers have used a fruit fly to steer a mobile robot through an obstacle course in the lab. They call it the Cyborg Fly. Chauncey Graetzel and colleagues at ETH Zurich’s Institute of Robotics and Intelligent Systems started by building a miniature IMAX movie theater for their fly. Inside, they glued the insect facing a LED screen that flashed different patterns. . . . Is this The Matrix, or Avatar, for flies? 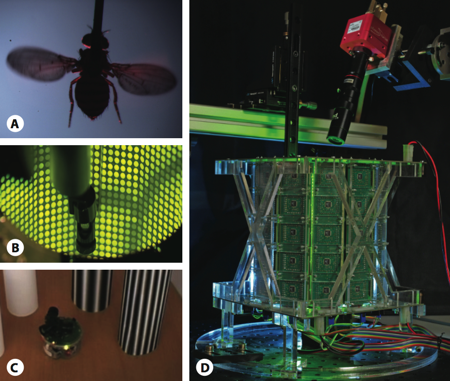 Graetzel tells me the goal of the project was to study low-level flight control in insects, which could help design better, bio-inspired robots. “Our goal was not to replace human drivers with flies,” he quips. Astrobotic will also leverage Caterpillar’s autonomous mining and construction machinery expertise. Carnegie Mellon University spin-off Astrobotic Technology announces that Caterpillar Inc. is a sponsor of the first of Astrobotic’s robotic expeditions to the lunar surface, which will collect data for NASA and extend the Internet to the Moon for the first time. . . The expedition also will claim a financial trifecta: up to $24 million in the Google Lunar X Prize, a $10 million data sale to NASA, and Florida’s $2 million bonus for launching from that state. A robot was used to plant a Chinese national flag at the bottom of the South China Sea, CCTV said. A multi-million pound project has begun to design a new breed of robot that can form memories and engage in social interaction. The following biography is taken from this web site: http://www.imagi-nation.com/moonstruck/clsc32.html where you can also find information about his plays and other works as well as biographical studies. A popular and controversial playwright, actor and director, Dario Fo has earned international acclaim for his political satires and farces. Often considered the rightful heir of Aristophanes, Fo has led the field in political satire in Europe for over thirty years. The main targets of his ideologically inspired attacks have been capitalism, imperialism and corruption in the Italian government. For performances outside of Italy, his comedies are frequently adapted to reflect local political conditions. Born in 1926, the son of a railroad worker, Fo began his career as a performer in satirical cabaret-style revues. Later, he wrote, produced and directed a string of successful “bourgeois comedies” (so called because they were performed mainly for middle class audiences). He has also written for and performed in several films and his one foray into television was as writer, director and co-star of Italy’s most popular television series, “Canzonissima”, which was ultimately removed from the airwaves by the Italian government after Fo portrayed a 12th century Pope who was known for being particularly cruel and hanging monks by their tongues from the church doors when they didn’t agree with him. Fo was refused a visa to enter the United States during the 1970’s and 80’s under the McClaren Act. It was not until Robert Brustein and the American Reportory Theater invited him to perform in 1986 that he was finally granted entry. At the time of this appearance, he made a point to thank Ronald Reagan for all the publicity that had been generated by keeping him out of the country. simply to pass part of an enjoyable afternoon. This was the most elaborate of all displays we have had over the past five years. As one veteran GAAF staffer pointed out, we have the hardest booth to set up and the hardest one to take down. Thankfully this year we had tremendous help from Nick McQuerrey for both parts of the battle. 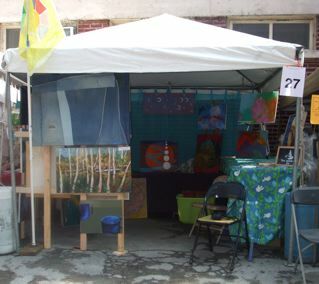 The result was a very successful fair. One element of our success was that Chris Drew brought his portable screen-printing apparatus to our booth to produce, hand out and sell his free-speech art patches. He has done this for the past two years as well, and has always contributed to the atmosphere we hope to create with our booth. This year his presence was an even greater contribution, owing to his arrest for attempting to sell $1 art patches in the downtown area of Chicago (a misdemeanor); then his being charged with felonious evesdropping for audiorecording his own arrest; and now, with the ACLU taking on his case a major story appeared in the Chicago Tribune the week before. You may have read about his experiences over the past year on this blog. Many people coming along Glenwood Ave. and by our booth were excited to meet Chris and to talk with him about his concerns. In turn, they got an education about the state of artists’ rights and the way in which his case impinges on everyone. If the Illinois eavesdropping law is upheld, it means that anyone with a cell phone recording device will be unable to protect him or herself in case of wrongful arrest by recording that arrest. If you missed us this year, hold the dates for next year and plan to come by! 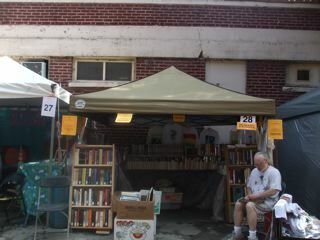 Along with this post are pictures of our booth and the adjacent booth, the phoebemoon studio booth set up by Diana Berek. ATLANTA, photographer Michael Schmelling’s new book, captures the city’s vibrant hip-hop culture. The volume includes essays by Kelefa Sanneh and Will Welch’s interviews with André 3000, Big Boi, Gucci Mane, Ludacris, Shawty Lo, and The-Dream. Accompanying download features unreleased tracks from the scene’s rising stars. Chronicle Books will publish Atlanta, the new book from acclaimed photographer/director/author Michael Schmelling, on November 1st. Atlanta evokes the incredible diversity of the city’s hip-hop scene, capturing the lives of everyone from up-and-coming rappers to club kids to multi-Platinum artists. It also includes a series of insightful essays by The New Yorker’s Kelefa Sanneh. Exclusive interviews with key figures like André 3000, Big Boi, Gucci Mane, Ludacris, Shawty Lo, and The-Dream were conducted by Will Welch, an associate editor at GQ. Each book will contain a code enabling readers to download a mixtape of tracks from many of the unsigned musicians featured in Atlanta, including Travis Porter, 3rd Degree, Pill, Lil Texas (who is the subject of the striking cover image) and Them Concrete Boyz. “We wanted to let people hear the music that the kids in the book are making in their homes and self releasing,” says Schmelling, who was the principal photographer for The Wilco Book. His work has appeared in numerous magazines and newspapers and has been exhibited throughout the U.S. and Europe. Between 2007 and 2009, Schmelling and his collaborators gained unprecedented access to the underground hip-hop scenes bubbling beneath the city’s surface and the lives of the young musicians and fans at its core. In a stunning series of black and white photos, he captures the heretofore-undocumented teen party scene – alcohol-free parties catering to the underage crowd, typically thrown by promoters in office parks after dark. 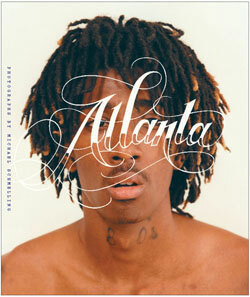 Like Atlanta’s ever-evolving music scene, Schmelling’s concept for the book changed over time. He initially envisioned a photo book based on OutKast’s Aquemini. But as he immersed himself in the culture, he decided instead to look back by looking forward. Sanneh puts things into historical perspective, describing how Atlanta replaced New York City as the hip-hop capital “by default – the place where you could hear the next hit first, the place where kids and grown folks alike still seemed excited about hip-hop, the place where you could get the best mixtapes” and taking readers inside its many subgenres. The book is available for pre-order by clicking on the publisher, Chronicle Books. Social documentary photographer Milton Rogovin, now 100 years old, has been likened to the great social documentary photographers of the 19th and 20th Centuries, Lewis Hine and Jacob Riis. His work speaks of the humanity of working people, the poor and the forgotten ones. Milton’s photographs are a part of the documentary photography collections of the Library of Congress, the J. Paul Getty Museum, the Center for Creative Photography and other distinguished institutions around the world. His photography has been published in books and journals, and celebrated in exhibits around the world. The extraordinary Chicago exhibit will include photographs never before exhibited, all originals, curated specifically for the exhibit to begin in January at Roosevelt University’s Gage Gallery. A number of events will be held in conjunction with the exhibit, including a closing as part of the National Working Class Studies Association meeting, to be held in June, 2011. 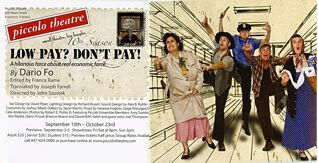 Save these dates: January 20 to June 30 2011. 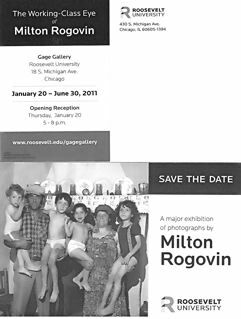 For more information on Milton Rogovin, visit his web site here.